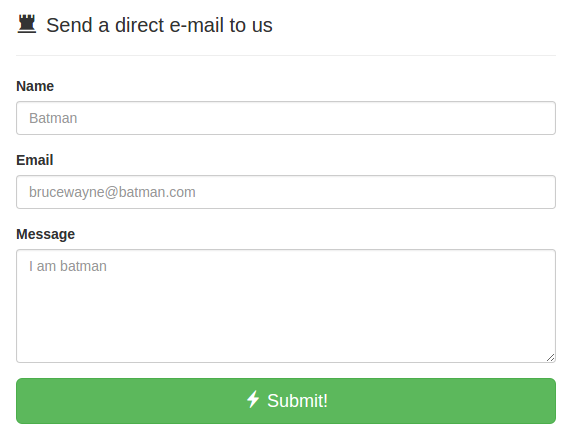 Implementing contact form in your website is a nice feature. The data of contact form can be stored in database or directly sent as e-mail. Setup a gmail account to receive the contact e-mail. You can also setup Outlook or other account and change the below configuration accordingly. We will including bootstrap.min.css and bootstrap font (//netdna.bootstrapcdn.com/font-awesome/4.0.3/css/font-awesome.css" rel="stylesheet) in html first. 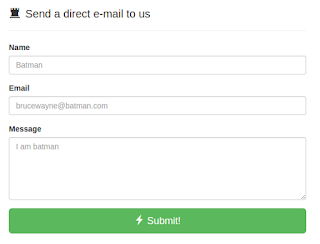 Name, e-mail and content input field and Submit button. class.phpmailer.php will also using other classes, so we need to include class.phpmailer.php, class.pop3.php, class.smtp.php and PHPMailerAutoload.php. Hello. Do you enter the email you want the data to be sent to inside the Quotations? Probably a bit late but in PHP you would put your email address in single 'quotations'. I used a HTML to PHP method quite a bit differant to this but the synax I know would use ' ' ... I hope this helps someone in the future. I just needed to record a speedy word to express profound gratitude to you for those magnificent tips and clues you are appearing on this site. We are providing AngularJs training in Velachery.